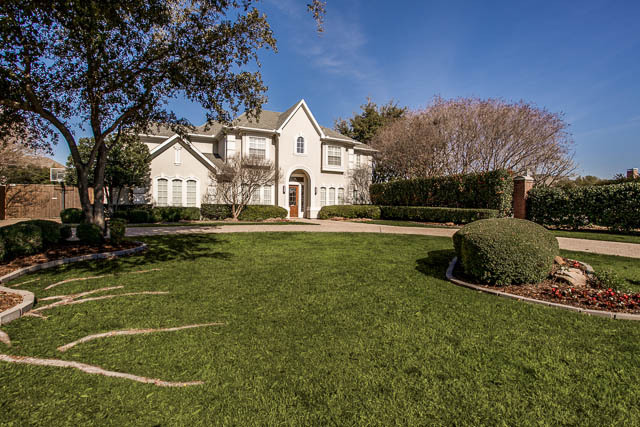 3225 Oak Hollow is Nestled in the prestigious Hills at Prestonwood Golf Community. It’s in walking distance to Arbor Hills Nature Preserve, upscale shopping and all major thoroughfares. Minutes from the Dallas Tollway. Coveted Plano schools, LUX master spa bath to die for! Pristine & relaxing outdoor entertaining area with pergola, pool, spa & pond. If you’re looking for something that is traditional yet contemporary this home could be for you. This home has all the rooms you’re looking for. 5 bedrooms, 2 down, that could serve as nanny quarters or mother- in law suite off the kitchen. Very private. Also on the main floor is large family room as well as, formal living & dining plus a study with french doors right off the entry. Upstairs is 3 extra bedrooms plus a media or game room that’s wired for just about anything you want to do. For all you car buffs: 3 car large garage with new polyurethane flooring, ducted for HVAC and plenty of overhead storage plus dual battery backup Liftmaster garage door openers and keypads. 3225 Oak Hollow – What You’ll Love about this Home! Lux Spa Master bath to die for!